Alex Barton has played significantly in his three-year career, including as a freshman on the Oilers’ state title team. Central Plains is 24-2 in his career, including a 2-0 start this fall heading into Friday’s key Central Prairie League road game versus Otis-Bison. Barton was instrumental in the Oilers’ 48-22 season-opening road win versus Victoria and last week’s 54-8 victory against Ness City for new sophomore quarterback Devin Ryan. A junior captain, the 6-foot-3, 177-pound Barton caught a leaping touchdown pass over the secondary in the end zone and also caught a score off a halfback pass against Ness City. In Week 1, he helped end the Knights’ 24-game winning streak with nine catches for 242 yards and two touchdowns. and helped Central Plains hold a 264-17 edge in passing yards. In his first two seasons, he caught 24 passes for 317 yards and five scores. Becker has been a standout player on a struggling Herington team for his entire high school career. After posting a 1-26 record in Class 2-1A the past three seasons, the Railers made the move to 8-man football this fall and have started the season 2-0. Becker is a big reason why. He’s rushed for 413 yards and six touchdowns, passed for 102 yards and a score, and been the same tackling machine he’s been throughout his career. Becker has received Kpreps All-District honors as a linebacker in each of the past two seasons after earning honorable mention as a freshman in 2013. He’s registered 390 career tackles, including 20.5 tackles for loss. His tackle totals have improved each season from 96 as a freshman, to 121 his sophomore year, and 150 last fall. He already has 23 tackles including three for loss this season. He’ll need another big game to lead the Railers past Centre-Lost Springs and to three wins in a season for the first time since 2011. The Tigers are perhaps the most consistent program in Kansas over the last 25 years and a big reason is line play. They return division-one recruit Kirrian Kirby on the line, one of Kansas' best for the Class of 2017. Blue Valley is averaging 320.5 passing yards per game and another 168.5 on the ground in 2016. Matthew Dercher has emerged as a playmaker at quarterback, and Will Evans is back again to carry the load at running back. They have EKL opponent Blue Valley North on Friday, a game they want bad to make up from last years’ one point loss to the Mustangs, 28-27 in Week 5. Dubbert is a talented athlete that excels as a quarterback for the Blujays, and is also one of the best all-around basketball players in the state. The Blujays opened the season with a 56-32 win over Chase, a game in which Dubbert completed 12 of 15 passes for 162 yards, four touchdowns, and two rushing scores. Last week the Blujays fell 50-18 to 8-Man I's fifth ranked Osborne Bulldogs, but even in the loss Dubbert was 22 of 35 passing with 187 yards through the air. This week St. John's plays host to a Bennington team that has given up 118 points over the first two weeks of the season. 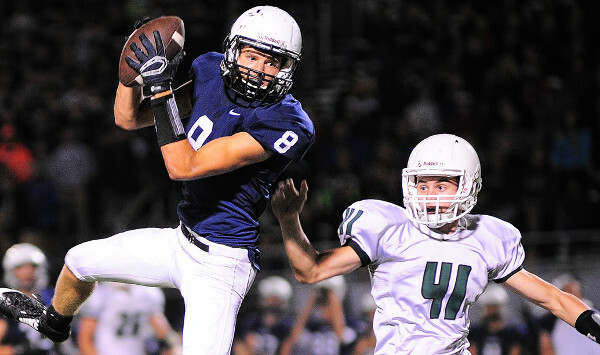 Hartman (6-0, 175) seems to be developing into the go-to receiver for new Mill Valley quarterback Brody Flaming. The senior has 16 catches for 341 yards and five touchdowns in the Jaguars’ first two wins. Last week against Blue Valley Northwest, Hartman hauled in eight receptions for 236 yards and three scores. He has already surpassed his receiving totals from his junior season where he caught 12 balls for 207 yards. Hartman and the Jaguars host Blue Valley Southwest this week. The junior quarterback has thrown for three touchdowns in each game for Class 4A Division I’s top-ranked Bishop Miege Stags (1-1). Last week, Putz was an accurate 16-of-23 passing for 231 yards during a 38-7 win over Gardner-Edgerton. He added 44 yards and a touchdown on six rushing attempts. For the season, Putz has completed 66 percent of his passes for 585 yards and six scores. He will need another strong outing this week as the Stags will be tested against 5A’s second-ranked St. Thomas Aquinas Saints.